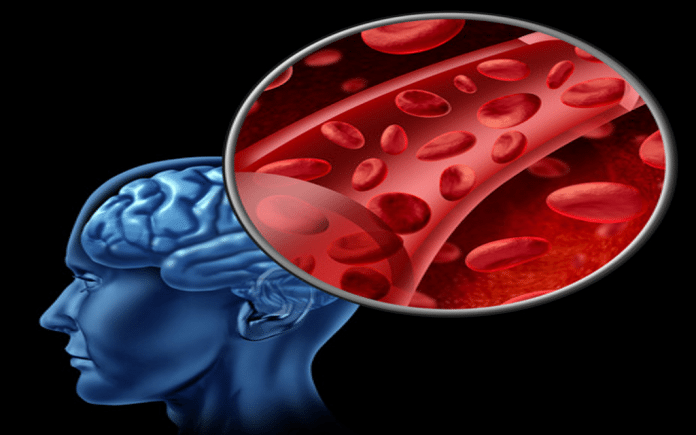 Migraines, headaches, multiple sclerosis, dizziness, and cerebral palsy are just some of the conditions influenced by blood flow to and from the brain. The sensations of vision, hearing, taste, and smell are also dependent on good blood flow in the brain as are the skills of thinking, talking, and moving. Here are five ways to have a positive influence blood flow from the brain, in other words improve venous drainage via the veins, primarily the jugular veins and vertebral veins from the head. Blood flows out of the brain differently, depending on body position. In the supine [lying on the back] position it flows out mainly through internal jugular veins, while in the upright [sitting] position it uses the vertebral veins. This phenomenon is probably not due to the active regulation of the flow but instead results from the collapse of jugular veins when the head is elevated. Such a collapse is associated with a significant increase in flow resistance, which leads to redirection of the flow towards the vertebral pathway. Theoretical calculations respecting the rules of fluid mechanics indicate that the pressure gradients necessary for moving blood from the brain toward the heart differ significantly between the supine and upright positions. While it is not possible to live life laying down, lying supine or on the back can improve drainage from the head. The arterial and venous anatomy inside and around the skull and spinal column presents a complete vascular system with the capacity to regulate intra-cranial pressure to a level of equilibrium slightly higher than atmospheric pressure. Variations in cerebrospinal fluid (CSF) pressure control the volume of blood draining through the cavernous sinus and hence into the inter-vertebral venous plexus in relation to the jugular vein. Stable intra-cranial pressure is maintained by a controlled release of venous blood through the inter-vertebral venous plexus (slow) and the jugular vein (fast) in the cavernous sinus. Any distortion of the skull from its healthy state will lead to reduced intra-cranial volume. The process of release from the state of compression has been interpreted as “cranial rhythm” but may be a mechanical adjustment increasing the internal volume of the skull, aided by the continual maintenance of stable intracranial pressure. This involuntary movement is capable of being assisted manually [by a cranial practitioner, osteopath, chiropractor, integrative manual therapist and more]. Besides consulting a cranial practitioner, there is a self-care exercise that can help lymph drainage from the head. Place one hand on top of the head. Move the opposite shoulder rapidly forwards and backwards ten times. This activity creates a pumping action through the contraction and relaxation of the pectorals muscles which overlie the large lymph vessels in the upper chest area and help drain excess fluid from the head and the rest of the body. Using magnetic resonance imaging (MRI) coregistration techniques to track brain volume, researchers looked at whether liver disease alters brain size. Measurable changes were found after [liver disease] treatment intervention, but there was no correlation with severity of encephalopathy or liver dysfunction. Our results support the hypothesis that low-grade brain swelling is present, even in minimal hepatic encephalopathy. Researcher went on to say treatment for liver disease improved the size and function of the brain. There are many ways to improve liver function with diet including eating enough protein, staying away from alcohol, and eating leafy greens. There is also an acupuncture point for the liver meridian on the top of the foot near the space between the big toe and the second toe. Pressing or rubbing this point can help support liver function. This exercise for the Esophagus is performed in standing and can be performed daily. Address any concerns to your primary care physician. Always place a hand on the body over the organ. Place a hand over the esophagus (center of the upper chest). Bend the right knee slightly. Lift the right shoulder girdle (shoulder shrug). Bring the left shoulder girdle forward. Tuck the chin in. Hold this position for one minute. In acupuncture [on cadavers] of Tiantu (CV 22) and Qishe (ST 11), the needle not only easily injure the upper pleural cavity, but also damage the big blood vessel and the vagus nerve in the mediastinum and the cervical root. Zhongguo Zhen Jiu (Chinese acupuncture & moxibustion), 2007. These points can be stimulated by tapping or rubbing along the collar bones or in the notch between the clavicles or collar bones. The stomach meridian is also associated with the color yellow and the earth elements which can be used in visualizations or guided imagery along with tapping or rubbing of the points. The conception vessel 22 is also associated with the throat chakra whose color is blue. Whether you need help with migraines or dizziness there are many complementary and alternative medicine ways to improve blood flow from and to the head. Feel great today.